Cloud-based applications have seen a great uptake in recent years, and that is especially true for microservices-based apps and related orchestration frameworks. 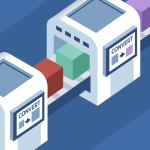 These types of applications create needs for load balancing in new contexts, and here at HAProxy Technologies, we are always happy to empower our community with solutions to help it grow. We have developed a number of features over the past year that enable easier integration of HAProxy with Kubernetes and other dynamic environments. The relevant features include hitless reloads, dynamic configuration without reloading using the HAProxy Runtime API, and DNS records for service discovery. With HAProxy already being well known for its reliability, extensible features, advanced security, and leadership in performance amongst all free and commercial software load balancers, the Kubernetes user community is also supplementing our efforts with several Ingress Controller implementations that use HAProxy at their core, and we are committed to providing them with expert advice and code contributions to help them make the best use of HAProxy’s most advanced features. In this blog post we are going to show you how HAProxy can improve performance and out-of-the-box features for microservices-based applications by using one of these HAProxy Ingress Controllers. Kubernetes started out by relying on LBaaS capabilities of cloud container engines like GKE and AWS to provide connectivity between users and microservices components. But the community soon realized that there was a need for a more dynamic, independent, and portable way of providing the same functionality. Hence, the Kubernetes Ingress project was started. Ingress provides an implementation-independent definition of rules that govern the flow of traffic between users and components of a service. This feature is most easily demonstrated through L7 routing. With mappings of end user consumable URLs to specific microservices, Ingress gives users the choice of Ingress Controller that will actually implement the routing. While the option to use GKE or AWS always exists, standalone Kubernetes deployments have gained the option to use any load balancer with an accompanying Ingress Controller. The Ingress Controller provides functionality required to satisfy Ingress rules, and it also has to contend with the dynamic nature of the microservices for which it is routing the traffic. 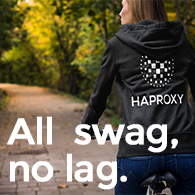 HAProxy is extremely fast and resource-efficient allowing you to get the most out of your infrastructure and minimize latencies in high-traffic scenarios. It also brings an almost endless list of options for tuning and customization. HAProxy’s features like dynamic scaling and reconfiguration without reloading are also very valuable in this use case as Kubernetes pods are often spawned, terminated, and migrated in quick bursts and in high amounts, especially during deployments. 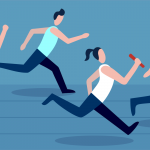 In our previous blog posts titled “Dynamic Scaling for Microservices with the HAProxy Runtime API” and “DNS for Service Discovery in HAProxy” we have covered two possible methods for dynamic scaling. In this blog post we are going to take a look at how these play a role in a Kubernetes HAProxy Ingress Controller implementation. Starting off with one of the examples provided in the Ingress Controllers documentation, we will deploy and enable two HTTP services with one of them serving as a default fallback. As a next step, we will set up the Ingress rules for L7 routing with the URL « /app » for hostnames, hostname « foo.bar » routed to the pods running the app « http-svc », and all other URLs routed to pods running the app « ingress-default-backend”. The option « backend-server-slots-increment » will allow us to tune Ingress Controller behavior in response to fluctuations in the number of pods running. With the setting of “4” in this example, there will always be up to 4 available slots in a backend definition to accommodate adding extra pods before HAProxy will increase the number of available slots. As pods are shut down and more than 4 slots in a backend definition become available, they will be removed to reduce memory consumption. For larger deployments, this setting should be increased accordingly and setting it to hundreds will have no negative impact. For this example we will also use an explicit service definition to allow client traffic to reach our Ingress Controller. Alternatively, this functionality can be left to external load balancer setups with access to both public network and internal Kubernetes network (a good place for HAProxy or a LBaaS) while retaining the L7 routing of the Ingress Controller. Checking that the L7 routing works as expected, we can see that the URLs below /app are being served by the echo pod, and all others are served by the default pod. Most of the above is entirely familiar to regular users of Kubernetes and Ingress, with the notable exception of adding the two options related to dynamic scaling in the HAProxy configmap. Taking a look at the HAProxy status page on external_ip:1936, we can see the two active pods of http-svc and two empty slots. With this, we can now add and remove pods of a service without HAProxy needing to be reloaded as long as the number of pods is within a multiple of the configured “backend-server-slots-increment” value (“4” in our example). When the set of active pods changes, the Ingress Controller issues commands over the HAProxy Runtime API to update the backend definition. At the same time, it records the new configuration in the configuration file for easier inspection and as a failsafe in the case of an unexpected reload. As mentioned, scaling above or below the initial multiple of “backend-server-slots-increment” will cause HAProxy to adjust the number of free slots for bursting pods. DevOps teams are often in charge of releasing new application code in production. To help with that, Kubernetes comes with a tool called « rolling update » which will move the pods to the new desired version. In essence, it works by starting a new pod with the new version of the application, and once it is up and running, the pod with the old version is shut down. Repeating this operation for each pod that is delivering the application could be tedious, but thanks to its controller, HAProxy can perform rolling updates with no effort! The recent release of HAProxy version 1.8 contains additional functionality added specifically for using DNS SRV records to implement dynamic scaling using DNS. While using DNS SRV records for configuring backend servers is not Kubernetes-specific, Kube-DNS is perfectly capable of providing this information to the controller, and our solution for making use of it with the same Ingress Controller is coming soon! If you would like to use HAProxy Enterprise with Kubernetes and get extra benefits such as a fully supported HAProxy installation, Real Time Dashboard, and management and security-focused enterprise add-ons, please see our HAProxy Enterprise – Trial Version or contact us for expert advice.